Cinnamon Ridge Farmshas been selected as a recipient of the Secretary’s Iowa Ag Leader Award in Education & Promotion. This award will serve as recognition and appreciation of your family’s leadership within the field of AgriTourism and contributions to the Iowa Agriculture industry. This award was selected by Iowa's Secretary of Agriculture, Bill Northey. 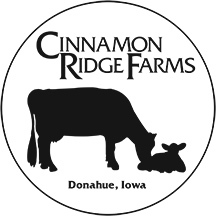 A Moo-vin' Destination - Iowa Cinnamon Ridge Dairy welcomes vistitors from around the world. See Group Travel Leader for the article. Our farm was featured in the January/February 2015 edition of Our Iowa magazine. This article highlights our farm store. Cinnamon Ridge is on the cover of Lely magazine. Lely is the maker of the robots. Orion Samuelson came out to interview John for this week in Agribusiness. This interview with Orion Samuelson highlights the tourism aspect of Cinnamon Ridge Farms. The first interview highlights the robotic dairy operation. Click the link to view it. corn, but you find time for everything,” he said. peeled on the long lane outside the windows. how professional agriculture is practiced in America.